Despite the best efforts of Jennifer Lawrence, two big family films, some horrible bosses, and The Mighty Christopher Nolan, according to Deadline, the weekend’s box office collapsed to a 16-year-low. Box Office Mojo reports the weekend earned just $70.4 million, which Deadline says is the worst post-Thanksgiving weekend, going all the way back to 1998. Mojo adds that this weekend was the second-worst of the year and somewhere around a 20% drop over this same weekend last year. The most troubling detail in all of this is the under-performance of The Hunger Games: Mockingjay – Part 1. The Jennifer Lawrence blockbuster is running way behind its predecessor, Catching Fire, which was released just last year during this exact same timeframe. After 17 days, Mockingjay sits at $257 million. 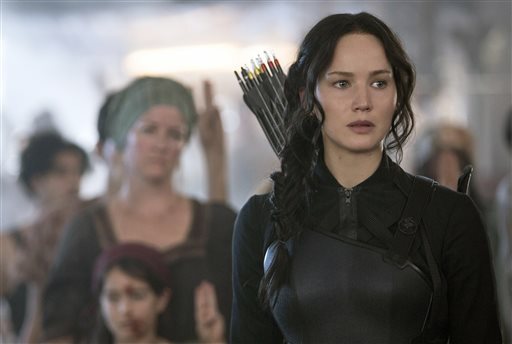 After the same number of days last year, Catching Fire sat at $335 million. Mojo predicts Mockingjay will top out at $330 million, or more than $90 million less than Catching Fire. That is a huge miss. While there’s no question Mockingjay is a hit and plenty profitable, after a summer filled with one under-performer after another, something appears to be happening at the box office that no title, not even a highly-anticipated Hunger Games sequel, can overcome. Fewer people want to go to the movies. After this summer’s box office closed to an 8-year-low, the refrain from Hollywood was wait until next year. The industry seemed pretty sure a number of big 2015 titles would fix everything. If a Hunger Games sequel under-performs, though, that puts pretty much every title in doubt.